Confined spaces are a special area of health and safety regulations. The regulations were introduced to reduce the number of deaths and serious accidents caused in confined spaces where people suffocated due to lack of Oxygen or being overcome by dangerous substances. They also took in to account how to prevent and deal with an accident in a confined area. 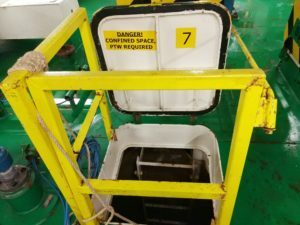 The regulations look at trying to reduce the need for employees to go into a confined area, introduced safe systems of work and ensured that businesses introduce suitable emergency procedures. When working in confined spaces there can be many dangers and even the most simple thing can be a massive risk. In this example, workers are needing to enter an empty petrol storage tank. Although the area is empty there is still a massive risk of fumes and these fumes could be explosive so they will need to full risk assess the area before entering and gain the appropriate permit to work. The area where they will be working displays the permit to work and all appropriate warning signs. There are enough people to enter the tank and to monitor the worker from outside. On call are the rescue crew who are specially trained in entering a confined space and performing an extraction of an injured worker. Before entering all the systems of work and the equipment are checked and tested and all work is carried out in accordance with the permit to work. In this case, gas alarms are used to monitor any build-up of fumes or gas and the area is being flushed with air using fans. At all times the person outside knows who is inside and how long they have been in there. Finally, if you think that you are working in a confined space ensure that you comply fully with the confined spaces regulations and that you have the correct training and equipment. If in doubt, don’t do it.